It's summer, which means many herbies will be packing their bags and hitting the road, sky, or sea (for travel tips and help, there's a huge (HUGE!) section in The Happy Herbivore Guide to Plant-Based Living). Cruises are always a popular vacation choice, especially this time of year. Scott and I actually went on a cruise back in 2007. I made sure to contact the cruise ahead of our trip to tell them about our dietary restrictions and they said they would be happy to accommodate us. While they DID have a vegetarian menu each night at dinner, we didn't do dairy, so it didn't really work. We were able to talk to the chef on our first night and he was able to come up with something (stuffed bell peppers with veggies and rice and sorbet for dessert). We ultimately found it more enjoyable to make use of the salad bar or the pizza station, which made pizzas on demand without cheese. They also permitted us to bring soy milk on board and there was a lot of fruit as well. Seeing as my last cruise experience was nearly a decade ago (and dining options and accommodations have probably changed since then), I was very excited to come in contact with Stephanie, a herbie AND a travel agent who knows a thing or two about cruise ships. My husband and I travel quite a bit because of my career as a travel agent, and because of that, we go on quite a bit of mainstream vacations such as visiting all-inclusives and sailing on cruise ships. We particularly enjoy cruises, and I have learned a few tips and tricks for those on board who only partake in plant-based eating like myself. - Each cruise line and ship is very different in terms of accommodations, entertainment, itineraries, rates, and general atmosphere. Furthermore, on-board dining experiences can drastically differ from ship to ship and line to line. There are no industry standards when it comes to venue options, buffet and dining room offerings, and willingness to assist you with specialized meal preparations, but each line and its crew should do their best to help you…just some might do a better job of it than others. Do some research or work with a travel agent to find the best cruise fit for you and your traveling companions. - You really need to work with your head waiter in the main dining room to have special meals prepared for you at dinner time, even if it means simply adjusting the next evening’s vegetarian offerings to be vegan-friendly – this is really the key to having great plant-based meals on board. The chefs are creating thousands of meals for thousands of people each day, so they really need advanced notice and additional time for special food preparations. - Get to know your head waiter, and be friendly! People are likely to be nicer and more helpful to, well, nice people! Work with him throughout the duration of your cruise to ensure that you are enjoying delicious plant-based/vegan food on a nightly basis. - Each line differs in their policies regarding food and drink items you are permitted to bring on board; usually, pre-packaged and sealed dry items like snack foods are fine. Beverages are a little trickier, so have your travel agent consult with your specific cruise line to learn what is permissible. Some lines will allow you to bring pre-packaged and sealed beverages onboard if they are required for special dietary needs (like the mini almond milk boxes you can purchase at the grocery store), but for items like this you really must check with each cruise line. Please note that cruise ships will not store or prepare special foods and drinks brought on board by passengers, but many have cabins with small coolers for keeping things chilled. - When in doubt, head for the fresh fruit buffet and salad bar. 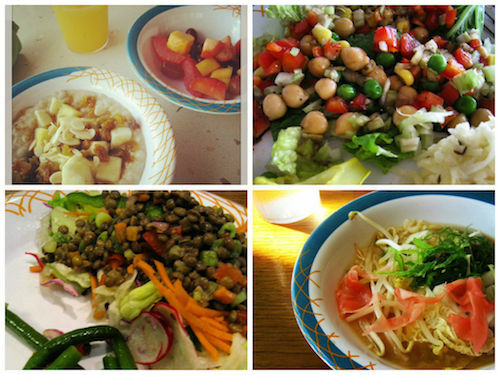 You will always find many options for produce in the buffets (breakfast/lunch/dinner). Stephanie Nyeis an Earth-loving, animal-loving, plant-loving, life-loving travel agent located in Cleveland, Ohio. LEGAL DISCLOSURE: Even though Stephanie receives discounts as a travel agent, she did not receive any discounts or a free trip from Royal Caribbean in exchange for this blog post. 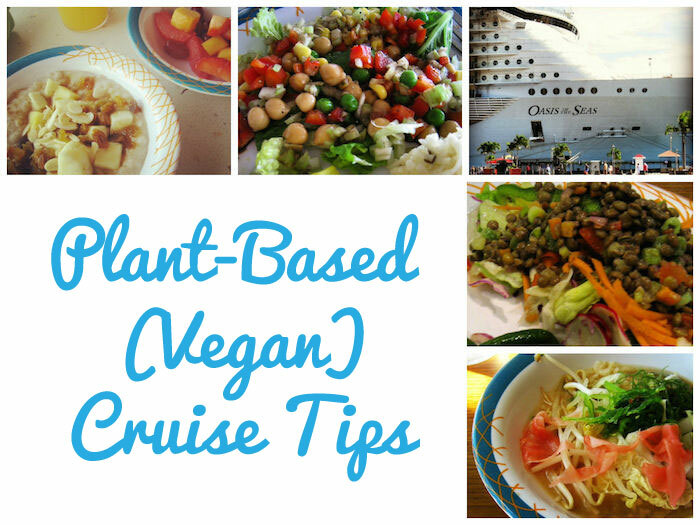 Have you been on a cruise while plant-based or vegan? Share your experiences (both good and bad) in the comments below!